The Signiant Media Shuttle Metadata feature enables you to link web forms with files that are uploaded using Signiant Media Shuttle. Improved traceability of submitted files: enables you to create delivery requests with pre-populated metadata and provide your suppliers with a unique URL which includes your ‘house ID’. Improved tracking of submitted files: query Signiant Media Shuttle for the metadata associated with any historical delivery by providing the unique tracking code. Quicker time to production: use your existing business logic and workflows associated with your existing web forms. Lower cost of development: re-use your existing web infrastructure and simply link it to Signiant Media Shuttle. Convert existing slow (FTP or HTTP) web delivery methods using Media Asset Managers and/or Digital Asset Management systems to high-speed delivery systems. Create new web delivery methods that use your existing business logic to process deliveries without requiring the “heavy lifting” associated with integrating acceleration technologies into your web infrastructure. An existing web server that can host a customizable web form application (serving form requests and responding to form submissions) that can be accessed securely by Media Shuttle (using https:// not http://). The ability to generate security signatures to exchange with Media Shuttle. 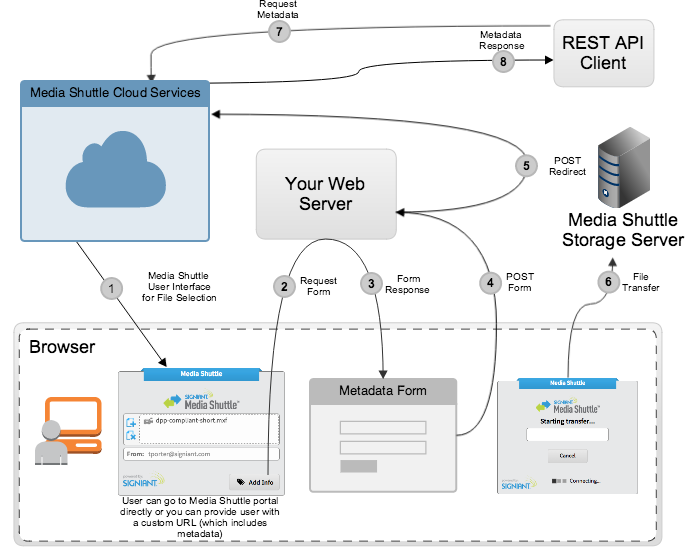 A Media Shuttle submit portal configured for metadata. Your web server must have an SSL certificate installed issued by a trusted certificate authority such as Comodo. Self-signed certificates are not accepted by Media Shuttle. This diagram illustrates the interaction between Media Shuttle and your web server. Media Shuttle provides a sample web form for each portal that allows you to see how this metadata feature is presented to the user. The following steps explain how to create and register a metadata web form. The first step in creating a metadata enabled portal is building a customized web form that collects metadata for Media Shuttle portal submissions. This form is a standard HTML document hosted on your web server and is accessed securely by Media Shuttle (using https:// not http://). See Handling Form Requests and Handling Form Submissions for details on the general requirements and guidelines that must be followed to ensure your form is properly displayed and processed by Media Shuttle. The second step is registering your web form with your portal using the Media Shuttle Management Console. During registration, Media Shuttle will assign a registration key that you will use to secure communications between your Media Shuttle portal and your web server. Log in to the Media Shuttle Management Console. To use metadata collection, enable Enable metadata collection. In Metadata provider URL, type the secure URL for the web server that hosts your form. Your web form application must be hosted on its own server and made available using HTTPS. To view our sample form, use the following link https://<portalUrlPrefix>.mediashuttle.com/metadata/sample/form. packageId The unique Media Shuttle package identifier for the set of files being submitted to Media Shuttle. This ID can be used later to make REST API calls for package information including files and metadata. redirectUrl The URL endpoint provided by Media Shuttle where your form must redirect to upon successfully processing the form. metadataId Optionally use this to track individual form requests by passing a metadataId parameter in request links to your portal. For example, you can give your portal users a link such as https://my-submit-portal.mediashuttle.com?metadataId=123 and Media Shuttle passes the key value pair metadataId=123 back to you in the web form post request. You must generate this metadataId and your web form application must perform any validation checks that you require. The POST request is encoded using the standard web form application/x-www-form-urlencoded content type. Note Sending an X-Frame-Options response header value of DENY or SAMEORIGIN in form request responses causes your form to be displayed incorrectly in Media Shuttle. You can optionally send a value of ALLOW_FROM URI where the URI is the Media Shuttle portal URI or omit this header in your response. Note Your HTML document is loaded as a self-contained web document and must include the scripts and styles it needs for your required presentation and functionality. Your web form application must handle valid and invalid form submissions. Any invalid submission should be handled by returning the appropriate HTML document response (for example, the validation error redisplays the form with invalid field markers). Upon successfully processing a web form submission, your server must respond with an HTTP 307 (Temporary Redirect) status. Your application may store the metadata itself. Media Shuttle also stores the metadata and continues with the transfer. CanonicalURL should be formed using the redirectURL post parameter passed by Media Shuttle when the form was requested. CanonicalQueryString must include the X-Sig-Algorithm and X-Sig-Date query string parameters. RequestPayload must be formed using the same form body that was posted to your web server. The web form redirect request your server makes to Media Shuttle. The REST API endpoint used to retrieve package details. Media Shuttle also applies the same signing process when sending web form requests to your server so that your server can verify Media Shuttle's identity prior to serving the web form. Requests are signed using the registration key that was generated when your portal was configured to collect metadata. Verifying the identity of the requester: signing ensures that the request has been issued by an entity that has access to the private registration key. Protecting data in transit: certain key request elements are used in the calculation of the signature hash in order to prevent data tampering. Protecting against potential replay attacks: a timestamp component is also included in the calculation of the signature hash to ensure requests cannot be replayed indefinitely. Requests are valid for 24 hours. To begin the signing process, you need to generate the string that includes information from your request in a standardized (canonical) format. Formatting the request into an unambiguous canonical format before signing ensures that when the request is received, the receiving end can calculate the same signature for verification purposes. The CanonicalURL is the normalized request URL from the beginning of the URL up to, but not including, the question mark character (?) that begins the query string parameters (if any). Do not URL-encode any of the unreserved characters that RFC 3986 defines: A-Z, a-z, 0-9, hyphen (-), underscore (_), period (.) and tilde (~). Percent-encode all other characters with %XY, where X and Y are hexadecimal characters (0-9 and uppercase A-F). Sort the encoded parameter names by character code (in strict ASCII order). Build the CanonicalQueryString by starting with the first parameter name in the sort list. For each parameter, append the URL-encoded parameter name, followed by the character '=', followed by the URL-encoded parameter value. Use an empty string for parameters that have no value. Append the character '&' after each parameter value except for the last value in the list. X-Sig-Algorithm=SIG1-HMAC-SHA256 this parameter specifies the version of the signing algorithm used. Here we specify the algorithm as SIG1-HMAC-SHA256. X-Sig-Date=<ISO8601 timestamp> this parameter specifies the ISO8601 formatted timestamp of the request. Requests older than one day are rejected by Media Shuttle. HexEncode represents a function that returns the base-16 encoding of the supplied parameter in lowercase characters. Hash represents a function that returns a SHA256 message digest. The RequestPayload is the request body represented as an array of bytes in UTF-8 format. The string to sign includes the RequestDate plus the CanonicalRequest generated in Step 1. The RequestDate is the ISO8601 timestamp of the request. It must match the timestamp specified by the X-Sig-Date query string parameter (explained in Step 1). HMAC_SHA256(key, data) represents an HMAC-SHA256 function that returns output in binary format. The RegistrationKey is the registration key that was generated when your portal was configured to collect metadata. The RequestDate is the ISO8601 timestamp of the request. It must match the timestamp specified by the X-Sig-Date query string parameter. After you've calculated the signature as a digest, the value is converted to its hexadecimal representation. You can query the details for the specified portal package including the list of files/folders, package size, status, sender and any associated metadata using the following REST API endpoint. Packages can be queried from the REST API immediately after form submission. You do not have to wait for the file upload to complete. portalUrlPrefix: the URL prefix portal of the portal's full URL. For example, for the portal submit-portal.mediashuttle.com, the value of this parameter is submit-portal. packageId: the unique Media Shuttle package identifier. The packageId is posted to your web server in the web form request body as a form parameter. See the Handling Form Requests section for more information on obtaining the packageId. The request query string must contain the following signature related parameters. See the Request Signing section for more details on how to set these parameters. X-Sig-Algorithm: Identifies the signature algorithm used to sign the request URL. The parameter value should be set to SIG1-HMAC-SHA256. X-Sig-Date: the ISO8601 formatted request timestamp. To calculate the request signature, you use a HMAC-SHA256 hashing function twice. Once to generate a signing key, and a second time to generate the final signature. Note: this is the hexadecimal representation of the binary key. The key itself should be used in binary format. After calculating the signature as a digest, convert the binary value to its hexadecimal representation. For a Linux example see Generating a Signature using Linux. $queryString = urlencode($algorithmParam) . "&" . $stringToSign = $timestamp . "\n" . $redirectUrl = $redirectUrl . "?" . Use the Media Shuttle Metadata Sample Form to configure a metadata collection form for Media Shuttle using Webtask. Refer to the instructions in Readme.md for additional information on using Webtask and the samples. Use the Media Shuttle Metadata Signature Generator sample code and instructions to generate signed request URLs for Media Shuttle metadata requests.